There was controversy even before the Dutch Grand Prix with the Trojan team being refused an entry for the third consecutive race. The team complained the British national sporting authority and the international sporting federation then announced that race organizers had to accept however many entries materialized. Thus Trojan was allowed to enter and there was a field of 27 cars at Zandvoort. There had been changes int he driver lineup with Shadow having signed up Tom Pryce as second driver, following Brian Redman's decision not to continue. Arturo Merzario was back in action with Williams (which rented the second car Gijs Van Lennep) and Hans Stuck had recovered from his broken thumb and was back in the March team. Surtees was down to one car as Carlos Pace had left the team after a dispute with John Surtees. He was not replaced. Qualifying resulted in an all-Ferrari front row with Niki Lauda once again beating Clay Regazzoni. The second row featured the McLarens of Emerson Fittipaldi (Marlboro) and Mike Hailwood (Yardley) while Jody Scheckter's Tyrrell was fifth, sharing the third row with James Hunt's Hesketh. The fourth row featured Jean-Pierre Jarier's Shadow and the second Tyrrell, driven by Patrick Depailler while the top 10 was completed by Denny Hulme (McLaren) and Ronnie Peterson, who was a little off form having been knocked unconscious in a pre-race testing accident in his Lotus. Jacky Ickx had another disappointing qualifying in the second Lotus, lining up 18th while Pryce impressed with 11th place in his Shadow. Also doing well was Guy Edwards's Lola which was 14th on the grid. In the race Lauda took the lead while Hailwood took second with Regazzoni third and Depailler fourth. Hunt made a poor start and then collided with Pryce at the first corner, putting both men out. On the second lap Regazzoni overtook Hailwood, while further back Fittipaldi took fifth place from Scheckter. In the lap that followed little changed, although Hailwood drifted behind Depailler and Fittipaldi. At mid-distance Fittipaldi worked his way ahead of Depailler, the Frenchman struggling with oversteer. This resulted in him falling behind both Hailwood and Scheckter. The top six then remained the same for the last 30 laps with Ferrari scoring its second 1-2 finish of the year. 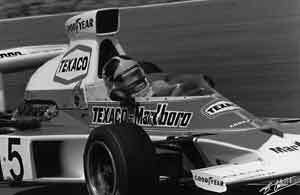 Fittipaldi managed to hold on to his lead in the World Championship with third place but Lauda was only a point behind with Regazzoni two points behind him.